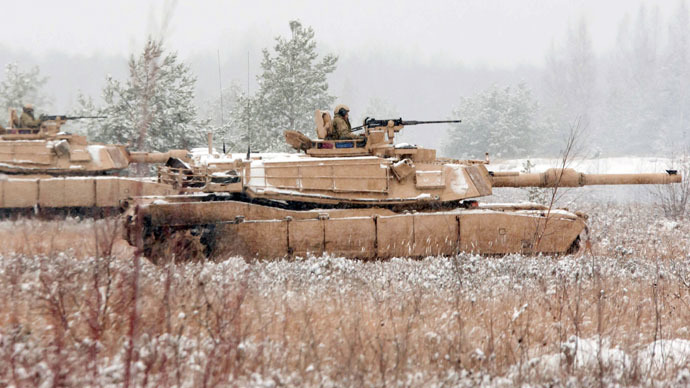 US Abrams tanks and paratroopers have arrived at a military base in the town of Tapa, Estonia, for upcoming exercises. The alliance continues its series of wargames at Russia's borders, claiming its allies are facing aggression. The arrival is part of preparations for drills set for May 4 to 15, codenamed Siil 2015 (which translates as Hedgehog 2015), says a statement by the Estonian Joint Staff. The exercise will employ 13,000 Estonian troops, as well as the American forces stationed in the country. The US armor and servicemen will also take part in rotation, replacing the American contingent currently stationed in Estonia. The troops and tanks were moved to Estonia from Latvia, and are a small part of the forces that recently arrived in Riga. The transfer of armor is part of Operation Atlantic Resolve - a series of US and NATO troop deployments and exercises that started last April. The operation's goal is to "demonstrate freedom of movement and deter regional aggression on the eastern flank of NATO", according to Pentagon spokesman Colonel Steven Warren, hinting at what NATO and US top brass see as Russian aggression. The latest operations performed under Atlantic Resolve include naval exercises in the Black Sea, as well as joint US-Bulgaria drills that will span the next three and a half months, and US-Polish missile exercises to be held later in March, which will involve an American Patriot missile battery. The increase of NATO activity at Russia's western borders has repeatedly drawn worried statements from Moscow. Deputy Defense Minister Anatoly Antonov sees it as a containment scheme against Russia: "Instead of uniting forces to fight evil, the worst of which is terrorism, Western nations are drawing new divisive lines, trying to realize containment schemes against unwelcome states. Today, Russia has been chosen as the target,” he said on March 5. In late February, over 140 piece of NATO heavy armor were paraded just 300 meters from the Russian border, in the Estonian town of Narva. Estonian Prime Minister Taavi Rõivas defended his country's right to host such a parade by saying that “Narva is a part of NATO no less than New York or Istanbul, and NATO defends every square meter of its territory”.